Photo of the day: How many licks does it take to get a first class seat? Previous post: How many pairs of shoes can a flight attendant pack inside a crew bag for a six day trip? Next post: How much do flight attendants get paid? F*CK! how long am i going to have to wait to use toilet?! I’m waiting. What do you want me to so? Rollover, Jump, Bark? Then I get a biscuit, right? You’d think they’d give me something better than the bulkhead. Do you know if the nearest tree is occupied? All i need to do now is not pee for a couple of hours and i will be fine. how many licks for a first class upgrade? Seating Assignments now go from Cutest to not so Cute. F*CK! how long must i wait for the bathroom?! What do you mean the forward lav is for first class only??!! 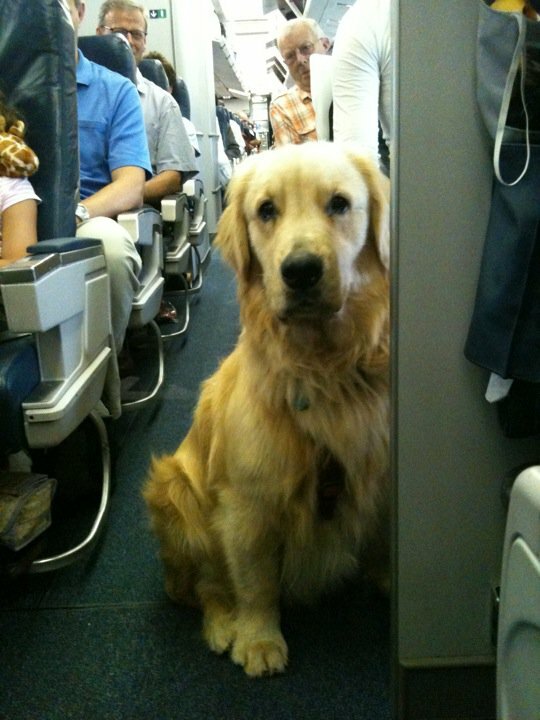 Umm, This guy here is in my seat…it says I’m in 1C on my boarding pass. Do you have an extra seat-belt extender please? What are you looking at me for? I belong here! Is it too late to upgrade to 1st class? So THAT’S what happens behind the curtain.. When it’s time for you to push that cart up and down the aisle, talk to me about what it will take to get me to move.